Schedule | International Powder & Bulk Solids 2018 | Vahid Mirsaiidi P.E. Vahid graduated from the University of Tulsa with a Master’s degree in electrical engineering. 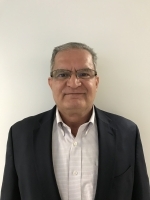 Beginning his career designing crankshaft position sensors in the automotive industry, he launched into instrumentation sales with petroleum overfill protection equipment before joining Auburn FilterSense as Manager Global Sales & Technical Support. Auburn FilterSense, the leader in providing Particulate Monitoring and Control Solutions in fabric filter applications, offers a full array of particulate monitors, ranging from a simple filter leak detector to EPA compliant high-performance measuring instruments. Controls include intelligent filter cleaning, to diagnostics controllers to optimize filtration and provide actionable diagnostics. Auburn FilterSense’s DynaCHARGE™ Particulate Monitoring Technology PRO model has been chosen by Processing Magazine as Breakthrough Product of the Year (2016).